Finally a reasonable temperature! I can’t tell you how good it feels to venture out without a heavy coat and safely bear ankle flesh! I wore this to a good friend’s birthday celebration at the Partisan on Saturday. 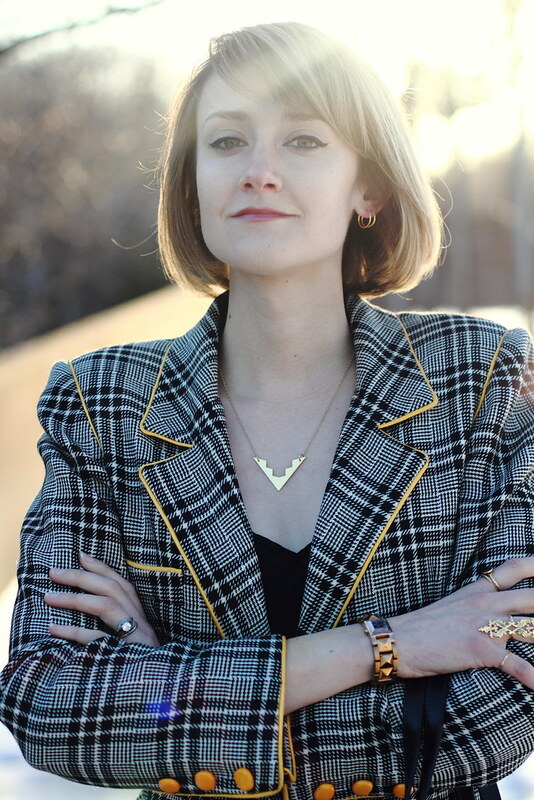 This vintage Ungaro blazer was a super exciting recent thrift find at, wait for it, $20 (!!!). There was hardly any thought process behind the purchase. Zombie walk to the cash register. Done. A great find indeed on that blazer! I LOVE the yellow piping on the plaid! And those shoes . . . It is finally starting to heat up here as well and I cannot tell you how elated I am! AMEN to the weather. I wore a skirt without tights today. WITHOUT TIGHTS. I have skin under there. Who knew? 56 degrees here in MN today-a dress and no tights today, and capri work out pants at the gym. Hoo Yah! gorgeous blazer!! and yay for fantastic lighting in these photos! This blazer is really amazing! I love the oldschool glencheck with the cool and modern yellow outlines! The pretty necklace caught my eye too, I'm a sucker for arrow/triangle necklaces! i am so excited for all the melting, and yes, yes, yes to that blazer! it was clearly meant to be yours.